This report is based on the findings of surveys on Americans’ use of the Internet. The results in this report are based primarily on data from telephone interviews conducted by Princeton Survey Research Associates International from April 26 to May 22, 2011, among a sample of 2,277 adults, age 18 and older. 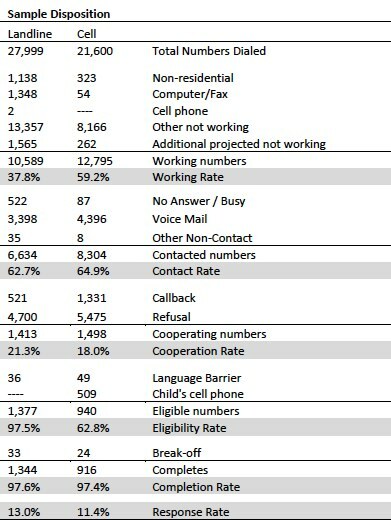 Telephone interviews were conducted in English and Spanish by landline (1,522) and cell phone (755, including 346 without a landline phone). For results based on the total sample, one can say with 95% confidence that the error attributable to sampling is plus or minus 2.4 percentage points. For results based Internet users (n=1,701), the margin of sampling error is plus or minus 2.7 percentage points. In addition to sampling error, question wording and practical difficulties in conducting telephone surveys may introduce some error or bias into the findings of opinion polls. Weighting is generally used in survey analysis to compensate for sample designs and patterns of non-response that might bias results. A two-stage weighting procedure was used to weight this dual-frame sample. The first-stage weight is the product of two adjustments made to the data – a Probability of Selection Adjustment (PSA) and a Phone Use Adjustment (PUA). The PSA corrects for the fact that respondents in the landline sample have different probabilities of being sampled depending on how many adults live in the household. The PUA corrects for the overlapping landline and cellular sample frames. Thus the response rate for the landline sample was 13.6 percent. The response rate for the cellular sample was 11.5 percent. This report is based on the findings of a survey on Americans’ use of the Internet. The results in this report are based on data from telephone interviews conducted by Princeton Survey Research Associates International from July 25 to August 26, 2011, among a sample of 2,260 adults, age 18 and older. 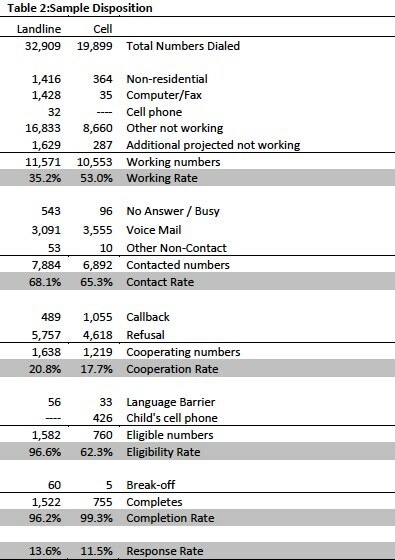 Telephone interviews were conducted in English and Spanish by landline (1,344) and cell phone (916, including 425 without a landline phone). For results based on the total sample, one can say with 95% confidence that the error attributable to sampling is plus or minus 2.3 percentage points. For results based on Internet users (n=1,716), the margin of sampling error is plus or minus 2.6 percentage points. In addition to sampling error, question wording and practical difficulties in conducting telephone surveys may introduce some error or bias into the findings of opinion polls. Thus the response rate for the landline sample was 13 percent. The response rate for the cellular sample was 11.4 percent.